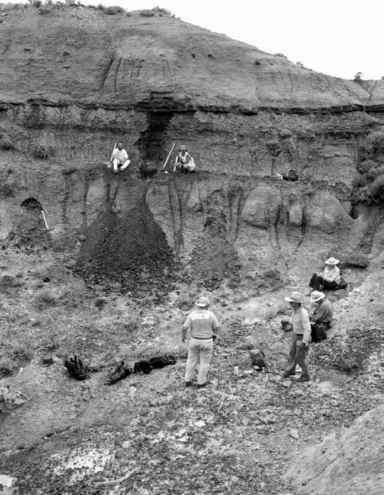 A paper published in 1980 in the journal Science revolutionized the science of geology. Coauthored by Nobel laureate in physics Luis Alvarez, his geophysicist son Walter, and two colleagues, the paper presented data from the esoteric field of neutron activation analysis. These data suggested that the Earth had been struck by a large extraterrestrial object (an asteroid or possibly a comet) some 65 million years ago, precisely at the moment in time that marked the boundary between the Mesozoic and Cenozoic eras (Figure 1.1). The time line, on a smaller scale also the boundary between the Cretaceous and Paleogene periods, was widely known as the K-T boundary ("K" being the internationally accepted abbreviation for Cretaceous and "T" being the corresponding abbreviation for either Tertiary or Paleogene, according to nomen-clatural preference). The paper (Alvarez et al. 1980) also proposed that this extraterrestrial impact had been responsible for one of the greatest episodes of extinction in Earth history. The K-T extinctions, which eradicated 70% or more of species on land and in the sea, ended the Mesozoic Era, the second of the three great subdivisions of life recognized by paleontologists. The cause of the K-T extinctions had long been argued in paleontology. The impact hypothesis had now been put forward as the explanation.